- Crouching Tiger, Hidden Dragon: ComicsOne, a publisher of Chinese Kung Fu comics in the United States, has been developing a comic book series which is based on the original novels from which the film is adopted. The first book in the series, illustrated by Andy Seto in full color, has been published. 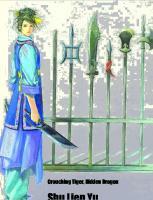 The comic series starts from the second book of Wang Du Lu's Crane - Iron pentalogy (the film is mainly adopted from the fourth book). A sample of the comic book can be read from ComicsOne's website. Picture from the book (right): Crouching Tiger's Yu Shu Lien. More information on Wang Du Lu's Crane - Iron pentalogy can be found in the Crouching Tiger, Hidden Dragon section (Novels). - Producer Thomas Chung talked to "Tianjin Daily" about Masked Crusader when he and Michelle were in Beijing earlier this month on the location scouting. He said the idea was inspired by Spiderman and Superman. He thought Chinese could have our own modern hero as well, and it would be more interesting if it's a heroine. "In 50s, a writer in Shanghai wrote a sequence of stories about a masked heroine. The stories got very popular, and many movies and TV shows about this masked heroine were made in Hong Kong during 60s and 70s. Masked Crusader is based on the same subject, but the story is newly written. We would like the story happen in modern time with some science fiction flavor." said Thomas Chung. The mask which will be used by Michelle is currently under design. Thomas Chung said it might be a bit comic book like and it will not cover the whole face. "The role will be played by Michelle Yeoh. Her audience would not like to see her face being all covered up when she does actions." Chung said the role is also humorous: "She is a fair lady in daily life. But she is very different when she puts her mask on. It's comedic." 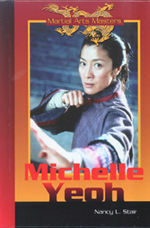 Talking about real kung-fu vs special effects, Thomas Chung said: "Masked Crusader will let Michelle show her specialty. There will be some special effects involved, but they will be only used for enhancing some actions so they would be more comic book-like." The director of Masked Crusader will be Jingle Ma. Chung said Jingle Ma is a popular director in Hong Kong and he can direct different styles of movies. He likes very much the action scenes Ma did in Tokyo Raiders and Hot War. If things go as planned, the shooting of Masked Crusader will start after Chinese New Year (February). In January they plan to go to Xinjiang and northeastern China for location scouting of Hua Mulan, which is aimed at the second half of the year. - Hong Kong news reported that Michelle and Thomas Chung returned to Hong Kong on 17th from a trip to Beijing. They had been there for more than 10 days on location scouting for the upcoming Masked Crusader. Michelle looked ill. She said the weather in Beijing was very cold and she had a bad cough. The production of Masked Crusader is aimed to start next February or March. The script is ready. Beijing will be one of the shooting locations. The cast has not been fixed except Michelle. "There will be a lot of action and it should be fun," said Michelle. 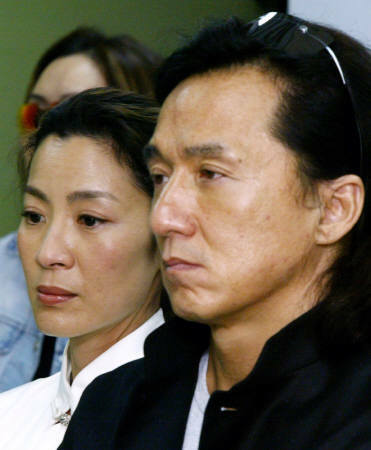 When told Jet Li was coming to Hong Kong for Hero promotion, Michelle said happily that she would try to contact this old friend of hers. Singpao photo: Michelle at the Hong Kong airport (click to enlarge). - Fixed the links to film theme files in Ah Kam. 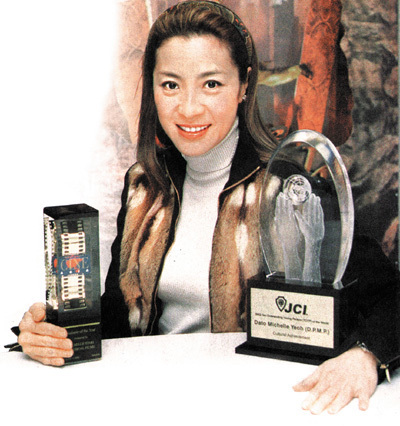 Michelle with her two recent awards trophies - CineAsia (left) and TOYP (right). Dayoo photo (click to enlarge). - Several Chinese newspapers reported a recent interview with Michelle, in which she talked about her getting the two awards as well as The Touch being disqualified for Oscar's best foreign film. Michelle said the awards don't belong to herself, especially the CineAsia best producer award, which is a result of the efforts of whole The Touch team. "The awards will encourage me to continue my dream in filmmaking and make good films in future." The people whom she would like to thank the most for The Outstanding Young Persons of the World award are her parents. "They gave me the biggest freedom in choosing my own path. Even though they worried about me, they never tried to stop me." Asked about the Oscar issue, Michelle said she didn't mind The Touch failed to enter the foreign film award. She questioned if some of the Oscar rules for foreign films are still suitable for today's situation since they were established decades ago. It's good that these issues have caught more attention, Michelle said. As for her film plans in the coming year, Michelle said the shooting of Masked Crusader will start in February. She will produce Jiang Shi in April. The bigger one, Hua Mulan, will go in production at the second half of the year. - Some new photos in The Touch -> "News Photos" (the section is now separated from "Production Facts"). - In Ah Kam: some new photos have been added in "Other Pictures". A new title pic. Also the film theme was replaced by newer version last month. Thanks BAM for providing the photos and recording the music. The ten recipients of The Outstanding Young Persons (TOYP) of the world were honored at an inspiring awards ceremony on November 25 in Las Vegas. Each trophy presentation was preceded by a short video highlighting the accomplishments of the honoree. The honorees gave their acceptance speeches. Returning to Hong Kong from the award ceremony, Michelle told the reporters that she felt honored and very happy. She said comparing to other nine honorees who were highly successful in various science fields, she felt what she had done was too little and she would work harder and devote herself more to the service to humanity and society. - Photo from MediaCorp News, Singapore: Michelle (middle) was touring the various exhibitions at the joint opening of the Asia Television Forum, Asia Animation and Asia Film Market & Conference on Dec. 3, with the Singapore Acting Minister for Information, Communications and the Arts, Mr. David Lim (left). The exhibitions include media sellers from around the world pitching their programmes to interested buyers. - The Academy published the list of the official entries for the 2003 foreign language Oscar category today. The Touch failed to make its entry because most of the dialogue is in English. 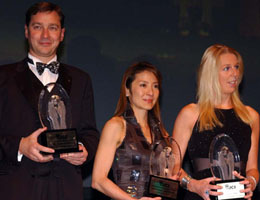 - Congratulations to Michelle and Thomas Chung for being awarded "Producers of the Year" at CineAsia 2002! CineAsia is the major convention and trade show for the Asia/Pacific Motion Picture Theatre Industry. The 9th annual CineAsia will be held in Bangkok, Thailand, at the Bangkok Convention Centre from December 3 to 5. At the previous CineAsia awards, Michelle was awarded "Excellence in Acting" in 1999 and Thomas Chung was awarded "Producer of the Year" in 2000. - Michelle will be attending Asia's three-in-one media festival - the Asia Television Forum 2002, the Asia Animation 2002 and the first Asia Film Market & Conference - which will be held from December 2 to 5 at Shangri-La's RasaSentosa Resort in Singapore. - Hua Mulan update: current status of the three Mulan films. - Hua Mulan related: shooting of Stanley Tong's The Legend of Mulan is postponed. - The Outstanding Young Persons of the World (TOYP): Michelle is selected by JCI (Junior Chamber International) as one of this year's TOYP honorees. The 2002 TOYP Ceremony will take place at the MGM EXF Theater in Las Vegas today, at 18:30-20:45 during the JCI World Congress (Nov. 23-28). The program each year honors up to ten young individuals who best exemplify the finest attributes of the world's young people. Michelle is awarded for her remarkable Cultural Achievement. Congratulations, Michelle! - Michelle's performance in Crouching Tiger, Hidden Dragon is listed by "Entertainment Weekly" (Nov. 29 issue) as one of the top 100 performances that failed to earn Oscar nominations. Oscar the Grouch: The 100 best performances that Oscar snubbed. Also on the magazine, Michelle's upcoming Masked Crusader was chosen as the winner at Winner/Losers of the Week (Nov. 15). - Note: If anyone had trouble enlarging the photos from the Biography, it might be okay now. I've modified the code to make it more cross-browser friendly. - The Touch soundtrack (thanks to BAM for finding the page). Note that the last two pieces are the songs from my site. Just let you know so you don't have to download them twice. 17 themes are featured in Mp3. If you'd like Realmedia format, another link can be found at The Touch -> Video/Audio. - Pusan Promotion Plan (PPP), the biggest Asian film project market in the region, took place from November 18 to 20 during the 7th Pusan International Film Festival (Nov. 14 - 23) in Korea. More than 1000 film professionals around the world ( including many film financiers, distributors and buyers) from 35 countries and 300 companies participated in the event. "Screen Daily" reported that Michelle made an unscheduled visit to PPP to seek financing for her company Mythical Films' forthcoming slate. - The Touch: latest news on the U.S. release and additional sales. - Tallahassee Democrat has an article on Dane Cook, one of Michelle's co-stars in The Touch. In the middle section, "Hey, that hurt", Cook talks about his experience in The Touch shooting with Michelle. - Note: I've added some protection on my site in order to prevent "hot linking" ("leeching"). Directly linking to any image of this site from your own webpage or a message board is not allowed anymore (broken images will be displayed). Hot linking had been happening too often (and too much!) and using the bandwidth of my web server in an undesirable way. If you would like to share a picture from this site with others, please direct them to here. Thanks for your visits and supports. If you notice any problem viewing images on this site (after reloading the page), please e-mail me and tell me what browser (including version number) you are using and which page(s) you have problem with. I do not intent to block my readers from downloading images to your own machine. - Michelle attended a charity auction, "100 Points of Light," organized by "Mother's Choice" at the evening of Nov. 9th, Hong Kong. As a special guest, Michelle lighted candles for the 100 children in attendance, and she chatted and sang with them. Her eyes got moist when she chatted with a child who was in wheel-chair. Michelle makes periodic contributions to children's charity organizations. Designer Barney Cheng, Michelle's friend who designed the Oscar gown for her, was one of the six designers who donated their work to the auction. Barney Cheng said the rug he designed was inspired by the dress that Michelle wore at the Malaysian premiere of CTHD. It has silver and diamond in the design, presenting both soft and hard sides of the life. Above: Michelle with a wheel-chaired child. Right: Michelle with Barney Cheng in front of the rug Cheng designed. Cheng said it was the first time he tried rug design. - Hua Mulan related: Stanley Tong's The Legend of Mulan is scheduled to start next February. - China's "2003 QQ Star", sponsored by Tencent.com and in cooperation with WhyNot-You, Han Entertainment and Motorola, is already in progress. All female QQ users in China, aged between 16 and 28, can register for the competition (Sept 20 - Nov 30). Various levels of candidates will be selected in December. Ten finalists will be chosen in January. Their files will be kept by Han Entertainment and they may have chance to participate in Han's future projects. Three of them will become Q-Gen representatives. 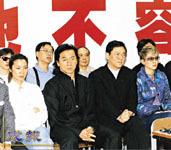 The "2003 QQ Star" will be announced at the end of January. The final lucky winner, besides the cash award, will be invited to join Michelle in her next film! - The Touch news updated: the film will be screened at MIFED (Nov. 3-7), Milan, Italy. Michelle Yeoh is to play a female Robin Hood in The Masked Crusader. The star of Crouching Tiger, Hidden Dragon, will also co-produce alongside her partner Thomas Chung. According to the Hollywood Reporter, the film is based on Wong Ngung, a woman who "fought for justice for the underdog." Here is today's Film headline at The Hollywood Reporter: Yeoh gets action on 'Crusader' pic. Masked Crusader is to be directed by Hong Kong cinematographer-turned-director Jingle Ma. The budget is about $10 million and the shooting is expected to start in January in Hong Kong, China and Japan. Michelle's Hua Mulan is scheduled to start mid-2003 for a summer 2004 release. - Yahoo Group: Michelle Yeoh Now, which was founded in 1998 and currently have 300+ members, is looking for a moderator to help managing the site. 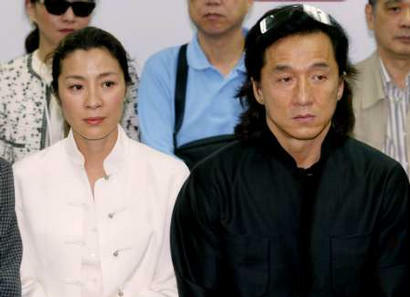 Good to see Hong Kong students getting behind Michelle Yeoh Choo Kheng in her moment of need. The star is pitched against screen sirens such as Ursula Andress, Honor Blackman, Jane Seymour and Britt Ekland in Hello magazine's reader's poll to find the Sexiest Ever Bond Babe. And several college student Web sites are urging local people to vote for the Asian icon. Now that's what radical democracy is all about. Currently Michelle has got 1152 votes and held a safe lead by 690+ at the Hello Magazine poll. The commentary track is by Michelle Yeoh and Peter Pau (and a segment by Brandon Chang). No subtitles available for the commentary track. 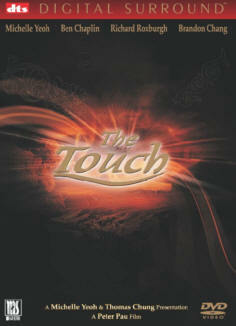 - The Touch official VCD (i.e. Video CD, not DVD) has been released in Asia this month and now it's available in some Asian video stores in U.S.. I got a copy yesterday here in L.A., at Five Star Laser, which also offers online order service ($9.95 for the VCD plus S/H). The VCD is listed at DDD House for HK$52.00 (approx. US$6.7). It is distributed by Mega Star, with non-stereo English and Mandarin soundtracks. The picture quality is normal as a VCD (usually worse than a DVD). It has a documentary on the The Touch premiere tour in various Asian countries (except Taiwan). - Michelle has been invited to attend Taiwan's Golden Horse Awards ceremony (Nov. 15) by the award organizers. As reported earlier, The Touch is not eligible for the awards because of the language. - Updated news on Hua Mulan and The Touch. - The Touch has been selected by the Federation of Motion Film Producers of Hong Kong as Hong Kong's Oscar submission for Best Foreign Language Film. More see The Touch page. - Masked Crusader - a new project of Michelle! According to various reports from Taiwanese reporters who interviewed Michelle at APFF in Seoul earlier this month, Michelle said she would make another film during the preparation of Hua Mulan. It will be an action film and shot in English. The shooting will start next January. - More than 116 Hong Kong leading film and television industry personnel from 61 companies will be embarking on a networking mission to Beijing to meet with mainland Chinese officials and counterparts. The goal is to develop further cooperation in the industry between the two regions. Michelle and Thomas Chung will be among the participants. The activity will last from Oct. 15 to Oct 18. - Malaysia News: on Oct 13, ABP-BH (Anugerah Bintang Popular Berita Harian) 2002, an annual prestigious award for the local entertainment arena (Most Popular Stars), presented a Special Jury Award to Michelle for her outstanding international achievement. - Just for fun: Crouching Tiger inspired, uh, fortune cookie? See an e-cookie here. You may send your own free e-cookies from Pfizer (thanks Jason). - The Touch title song: music (Mandarin and Tibetan versions), English translation, and Pinyin page. - [APFF] The Touch received Best Cinematography award at the 47th Asia Pacific Film Festival. Congratulations! See The Touch page for more details and photos. - [APFF] CNA (Taiwan) reported lately that Michelle would not be in Seoul until 4th, the last day of the film festival. - On the special 15th anniversary issue of Premiere magazine, Crouching Tiger, Hidden Dragon is selected as the No.1 Best Foreign Film and No.5 Best Action Film, and Michelle is selected as the No.4 Best Action Heroine for the past 15 years. - Sheryn, a Michelle fan from Malaysia, provided us some Magazine scans (articles and photos, from "The Malaysian Women's Weekly", "etc", and "Galaxie"). See "Links". Also a drawing of Michelle by a friend of Sheryn, David, is added in Gallery. Thanks, Sheryn and David! Sheryn has also sent in some exclusive photos from The Touch Malaysian premiere and Michelle at TOYM. I will try to get them up on the site soon. - Michelle will arrive in Seoul this Thursday (Oct 3rd) to attend the 47th Asia Pacific Film Festival (APFF, Oct 1-4, 2002). Other Hong Kong representatives in attendance will include Peter Pau and Thomas Chung (for The Touch), Vicky Zhao and Chang Chen (for Chinese Odyssey 2002). - Hua Mulan updates: more information on the multiple Mulan projects. - Hua Mulan page is up. At this moment it has a News column and a section "About Hua Mulan". - The ceremony of the 8th Huabiao Awards was held at 21st Century Theatre in Beijing on September 12th. 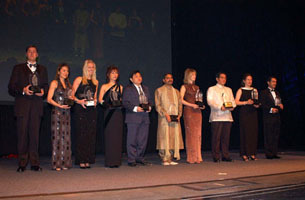 Total 31 films and 11 individuals received awards in 15 categories. As reported earlier, The Touch was awarded as the "Best Co-production Film". Michelle attended the ceremony in Beijing. Congratulations to the first award of The Touch! - New in The Touch -> Video: a video clip of the Asian release ceremony and press conference, July 25, Beijing. The press was held right after The Touch got the final approval from the Chinese authority and cleared the way of its release. At the press Michelle got quite emotional. - Han-Shop is hosting an auction on some The Touch items and stage property - including the scarfs Michelle used as a weapon in the film. - The Touch will attend the Feature Film Competition at the 47th Asia Pacific Film Festival (Seoul. 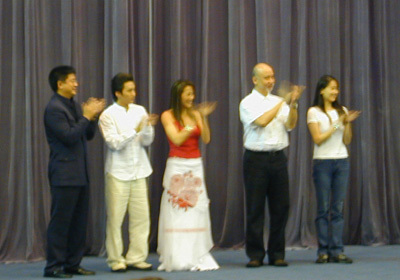 Oct 1-4, 2002), representing Hong Kong. 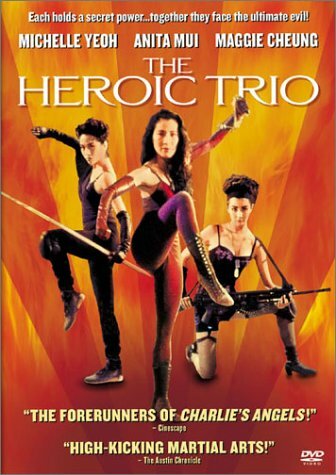 - The Heroic Trio, one of Michelle's best films and for which Disney had bought the exclusive North American distribution rights, will be released on DVD by Buena Vista Home Video (owned by Disney) on November 19, 2002. It's Region 1 encoded with a running time 85 minutes. Rated R. So Disney decided to skip its theatrical release... Right now I don't have other details about this video release - dubbed or subtitled, or if the original scores are kept. There might be some scenes cut since the running time of the film from Tai Seng and Universe are about 87 or 88 minutes. Well, at least this time they kept the original title, and I expect the picture transfer should be superb. Pre-orders are accepted at Amazon. Picture shown is a cover scan (click the pic to enlarge). - A celebration party for The Touch was held on August 31 at Shangri-la Hotel in Hong Kong. The Touch recently won the Huabiao Award in China. Details, photos and more news can be seen at The Touch page. Also a bit more information on Michelle's next project Hua Mulan. Photo at left: Michelle cheers with The Touch crew (Singpao photo). - A book about Michelle is published in U.S. by Rosen Publishing Group, a children's book publishing company. Features: Full-color Photos, Glossary, Bibliography, etc. - E! Online's 25 Toughest Stars (see news on May 20) will be aired at 2:00-3:00PM, Friday, August 30, ETV (thanks to Kityi). - The Touch was ranked No.2 at the box office in Taiwan at its first weekend release (August 16-18). - New at The Touch page: links to The Touch charity auction and e-cards. 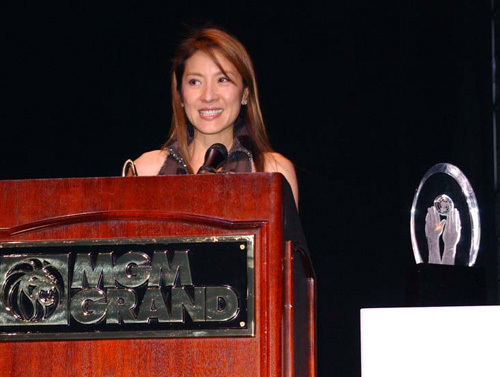 - Michelle Yeoh gets JCM award: Michelle accepted "The Outstanding Young Malaysian Awards", Aug 21. - No ordinary watch and shawl: The Touch item charity auction. - At The Touch page: the film continues to do well at the box office in China. Also some The Touch related articles have been added in The Touch Links (thanks to Yvonne for some of the links). - Han-Shop has been opened since the end of July and now more items have been added. You can purchase many The Touch related products - official script, posters, photos, soundtrack, T-shirts, etc.. Some of them even have options to be autographed by Michelle or Brandon Chang (you may indicate whose signature you want on the special request form at checkout - thanks to Dean for finding that one out!). Note: the site works better with Internet Explorer than Netscape. - On The Touch Official Site - in case you haven't seen: Michelle's diary in Beijing and HK Premiere Highlight. - On The Touch page: a report, some photos, and a video link on the Taiwan press conference and premiere. - Some (unconfirmed) reports say The Touch will be released in U.S. early 2003. - Michelle's Hua Mulan is aimed to start early next year, right after the Chinese New Year. - The Touch claimed the No.1 box office spot at the the first weekend at all territories where it has been released: China, Hong Kong, Malaysia and Singapore (Variety report). - Michelle was awarded "The Outstanding Young Malaysian Awards 2002". The awards presentation will be held at Kuala Lumpur on Aug 21. - Latest on Hua Mulan: according to Chinese news, the Chinese Film Bureau has approved three Mulan proposals after talking with all three parties but no one wanted to abandon their projects. One of the three is a co-production between a Korean film company and Shanghai Film Studio. Reportedly they are planing to get Zhang Ziyi to star as Hua Mulan. Zhang's agent (her brother) said he didn't know it and hadn't seen a script. Another one will be shot by China Film Group Corporation and directed by Stanley Tong. Tong's film will be entirely shot in English and his current choice for the Mulan role, according to Yangtze Evening News, is the American Chinese actress Lucy Liu (Charlie's Angels). Many Chinese audience think Liu is not pretty as an actress. 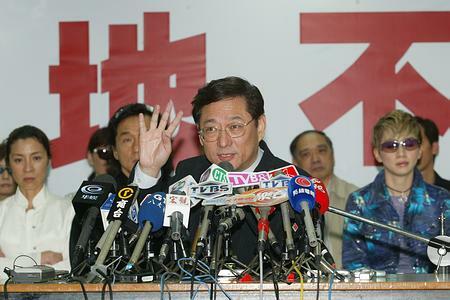 Stanley Tong said Hua Mulan should look like a general and being too beautiful or girlish would not be convincing. Michelle's Hua Mulan will be a co-production with Tianjin Film Studio. The co-producer Thomas Chung said they would like to make this film have a spirit of Ran (Akira Kurosawa) and Braveheart. It would be more difficult than shooting The Touch. The film will be shot in Mandarin. 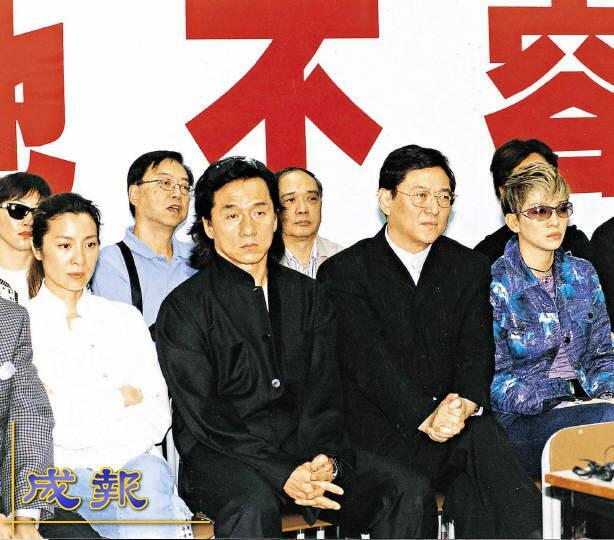 Reportedly the first choice of the male lead is Chow Yun-Fat. - See the latest updates on The Touch: a report and some photos on the Asian release ceremony of the film and press conference in Beijing, July 25. Also two new sections: Preview and Production Facts. Enjoy. - In The Touch -> Video: three new video clips from NetandTV.com: Making of The Touch, Michelle in Shanghai July 15, and an interview with Han Hong, the Tibetan singer who sings the Tibetan version of The Touch title song. In the interview she actually sang a little bit of the song (the melody is from a Tibetan folk song). The files are relatively small and easy to download. - A new poster in The Touch -> Posters. - The Touch Official Site is back online. - Due to the overwhelming responds, the birthday greeting signing will be extended one more day. It will be closed at July 24. - On sunday, the anti-piracy advertisement was shot at BVI (the company that is in charge of the distribution of The Touch in Taiwan). In the ad Michelle tears up a pirate disk. Michelle will have about five seconds of appearance - which is the core of the ad. The ad will start broadcasting in August in Asia. Michelle thinks the country which has the worst piracy problem in Asia is Malaysia. She said she will address this issue to the authority when she goes to Malaysia for the film promotion. Photos from UDN. Click to enlarge. 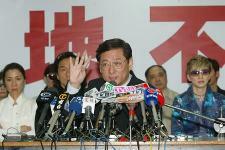 - A report and some photos of the Taiwan press conference is at The Touch news. - Report from Associated Press: Actress Yeoh Produces Feature Film. - From CNA (Taiwan): Michelle will arrive in Taiwan this Saturday for a two-day visit. She's going to hold a press conference for The Touch promotion on 20th. On 21st, She will shoot a short film on anti-piracy propaganda. It is a part of the anti-piracy efforts in Asia which are recently funded by a major U.S. film industry association. To show her support, Michelle will do it for free. The short film will be about 40 second long and directed by Chi Yin (Fleeing by Night). It will be made in English, Cantonese and Mandarin etc. and broadcasted across Asia. - CCTV (China) reported that Tianjin Film Studio, one of the co-production companies for The Touch, has signed the contract with Han Entertainment to co-produce Hua Mulan. Tianjin is the third largest city in China. 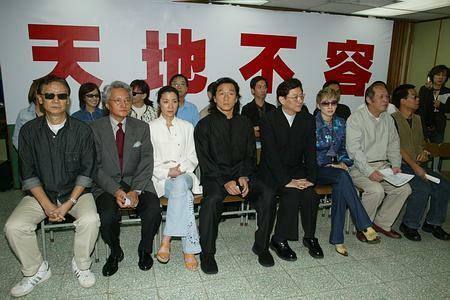 Tianjin Film Studio was founded in 1958. Since 1992, Tianjin Film Studio has produced more than 20 films and 30 TV series and been awarded over 73 prizes in domestic and international film festivals. - The Touch news updated. Finally we've got some information on the young Michelle acress. Also more photos from Michelle's Shanghai trip, etc..
- Another soundtrack sample, "Memories of Days Gone", is up at the official site. Here is a shortcut to The Touch soundtrack. - Michelle was promoting The Touch in Shanghai, China yesterday. For more details and some pictures from the film please see The Touch news. Photo at left: Michelle in Shanghai (click to enlarge. UDN/Reuters). - Information on the title song of The Touch. - The Touch Official Site: two new wallpapers and Artwork (Enhanced Media). - Some samples of the original 5.1 DVD soundtrack have been launched at The Touch Official Site (Enhanced Media -> Soundtrack) with animated photos from the film. - Several people I know - including myself - who wrote to Disney/Miramax have got initial responds from them saying our comments will be passed along to their Marketing Department for their future consideration. Write to disneyinfo@disneyhelp.com about your concerns/requests on releasing The Touch (etc.) if you haven't. - A new poster of The Touch is at The Touch -> Poster section. Thanks BAM for sending in a larger version. - HKFilm.net, who started the online petition to Disney for respectful treatment of Asian films months ago, now is making another push - a mass call/mail-in to Disney (and its subsidiaries, Miramax and Dimension) on July 8. Anyone who has concerns on The Touch and other Asian films handled by Disney/Miramax, please visit www.hkfilm.net/disney for details. Some discussions on the issue of Miramax US release of The Touch have been going on at the message board of The Touch Official Site. - The direct download links to the trailer and behind scene video of The Touch can been found at The Touch -> Video. - New at The Touch Official Site: The official trailer (the one which will come out across Asia in cinemas on July 4th) and a 5 minute Behind the Scenes video. Michelle was injured during one of the action sequences and you can see how it happened here (Go to Enhanced Media -> Trailer). - News on Hong Kong, Malaysia and Singapore premieres of The Touch.